A segmented control is a horizontally aligned set of segments, containing 2-5 buttons, that act as filters on a set of data by selecting them. Segmented controls can be used when you want to show or hide particular data without changing the current view. It works as a filter on a set of data. If the control doesn't work on the same set of data, you could consider using a tab bar. When content covers a certain item, but has to be divided into different subjects, you should use module tabs. 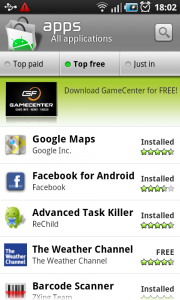 1 In Android Market all applications are divided into 3 segments, Top Paid, Top Free, and Just in. 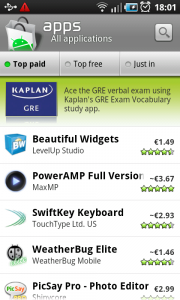 Here the Top Paid segment is selected. 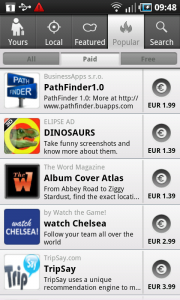 2 Tapping on the Top Free button, shows the apps that are listed in this segment. 1 Layar shows 3 segments that have overlap. The button All covers all layers, including the buttons Free and Paid, that for themselves show the corresponding layers. 2 Tapping on the Free button, shows the same layers that were also shown under the All button, which is not recommended. It would have been a better solution to not put all the free layers at the top. 3 The Paid button shows different layers. 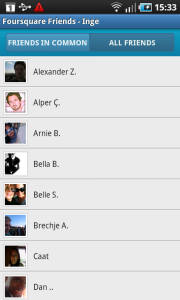 1 Foursquare shows the list of friends of a user's friend under a segmented control. Here only the friend in common are shown. 2 And by tapping the second button, all the friends are displayed. 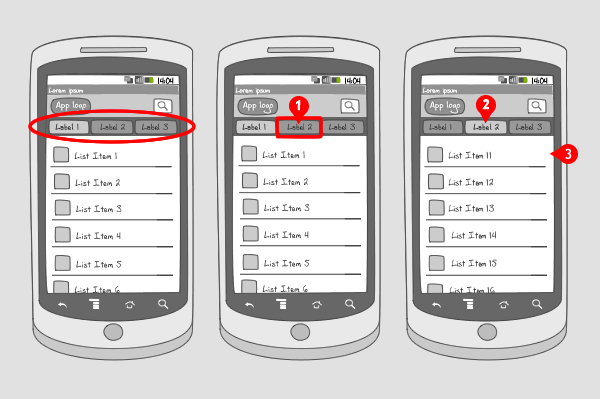 Please give me a link to describe how to create a segmented controls looks like android market. I need same thing can you just send me source code fotr above please.